Built in 1935 by the Tennessee Valley Authority and maintained and operated by the U.S. Army Corps of Engineers, the Kentucky Lock and Dam handles 50 million tons of barged cargo every year traveling up and down the Tennessee River. 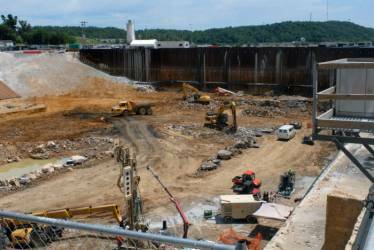 The Kentucky Lock Addition project was needed to increase the lock’s capacity to handle larger barges and heavier barge traffic with the construction of a new 1,200 foot lock. Construction on the project was originally started in 1998 but had been put on hold since 2009 due to lack of available funding. In 2011 the project was resumed after the award of American Recovery and Reinvestment Act (ARRA) funds. The lock addition includes the construction of nine upstream concrete monoliths. These monoliths are huge concrete sections of the new lock’s wall that are nearly 100 feet tall and require 130,000 cubic yards of concrete. As part of the construction of the new monoliths, in 2011 Portland Bolt supplied several hundred galvanized F1554 Grade 55 anchor rods and bent anchor bolts, custom sleeve nuts, and custom manufactured 21⁄4” diameter A354 Grade BD bent anchor bolts that were nearly 9 feet in length! As an ARRA funded project, all materials provided were required to be 100% domestic. With our 100 years of experience as a domestic manufacturer, the contractor knew that he could rely on us to provide the correct products, that the order would arrive on time, and that all materials would come with a full and complete certification package. Do you have a project with a domestic requirement or a time critical delivery schedule? Contact one of our experienced estimators today to discuss how we can help you out!